B 1921 W.L. Roberts. 2m, 17spst, 7c, el.pn. Gt: 8.8.8.4.16.8.8. Sw: 8.8.8.4.16.8. Ped: 16.16.8.16. As early as 1841, Wesleyan Methodist services had begun in private homes in the Walkerville area. In 1842, the present site was purchased and a 50-seat church was erected by voluntary labour the following year. Land for the adjoining cemetery was acquired in 1849. Initially singing was unaccompanied but with the advent of a new church in 1855 came a harmonium. The pipe organ did not arrive until 1921 as a memorial to the fallen of World War I. The cessation of hostilities on the world stage frequently saw the erection of memorials to the fallen. Though memories often fade, the organ at Walkerville is a memorial to the men of the church who had served in the First World War. The central plaque bears the names of 12 men who made the supreme sacrifice. The organ was opened free of dept largely through the untiring efforts of Mr Wilfred Hobba who was organist for 30 years.7 Built by W.L. Roberts, it was opened and dedicated by Brigadier-General S. Price Weir DSO VD on Sunday 27 November 1921 at the 11.00 am service. 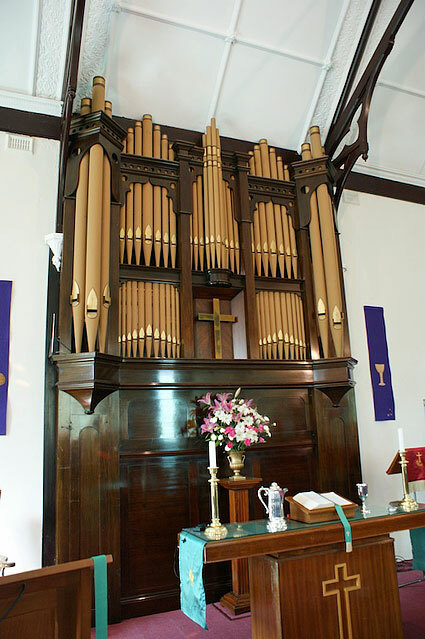 The instrument was of interest for the provision of Swell Oboes at 16 and 8ft pitch, and a Pedal Contra Dulciana 16, thought to be the first examples of such stops provided on a two-manual organ built in Australia. The casework was elaborate, with two outer circular towers containing three pipes and a slim central tower placed at an upper level on either side of two flats, each of two storeys. 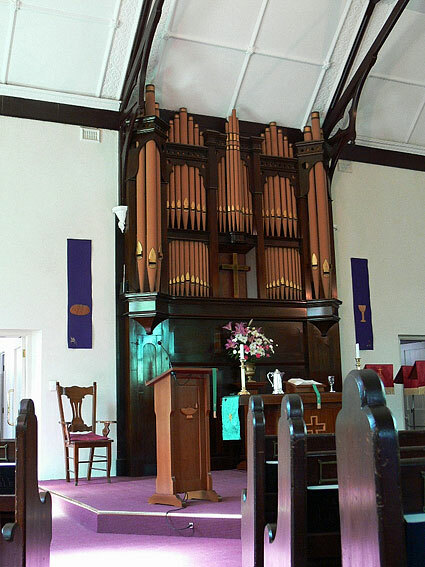 3 Witkowski was responsible for importing at least two pipe organs, one of which is at Holy Trinity Lutheran Church Nuriootpa (see entry); the other is at the monastic retreat of the Passionist Fathers at Glen Osmond. 8 Opening and dedication of the Memorial Organ Sunday November 27th 1921.